Many schools have started back, and Labor Day is almost here. Soon a lot of the fun places, like Hersheypark, won’t be open everyday. 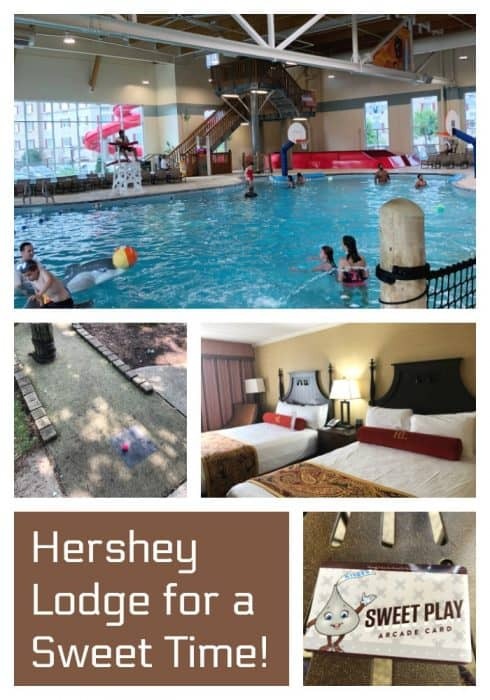 While the park won’t be open, there are still lots of things to do around the Hershey, PA area, including staying at the Hershey Lodge. 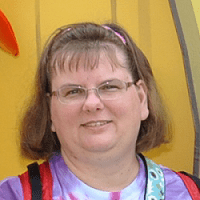 I want to share a story of a trip that we made to Hershey this summer that didn’t exactly turn out the way we had planned, but, even so, we still had a LOT of fun! Like many who come to Hershey, PA for summer recreation, we had plans. 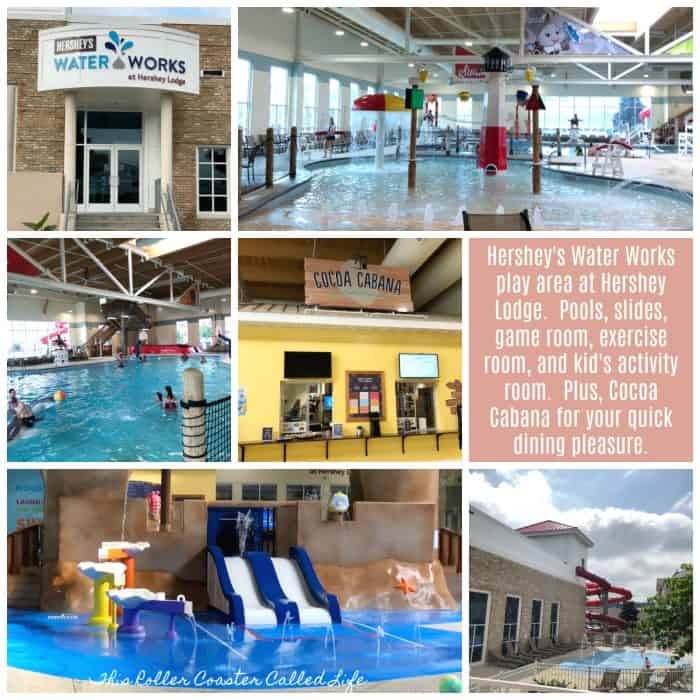 We were going to stay at the Hershey Lodge and spend a day at Hersheypark with a cabana at the Boardwalk (Hersheypark’s water park), expecting to have a relaxing day. We had taken vacation time off, packed our bags, and were ready for this expected short trip of great fun. However, “mother nature” wasn’t on the same page. 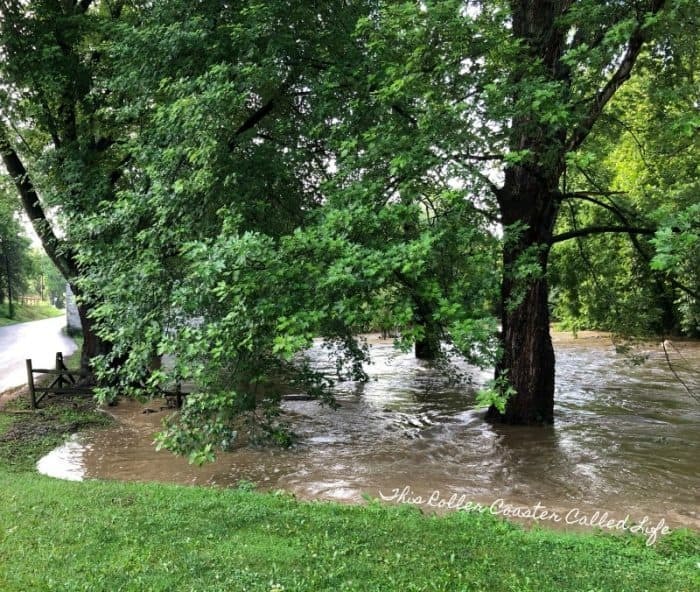 The morning we were supposed to head over for our “mini-vacation”, I encountered flooding on my way home from work. Hersheypark had been closed (YES, CLOSED) for a day a couple of days before for flooding, but we had hope that the park might be open because it had been open the day before. But, it had rained through the night. The park was closed for the day again. We had already taken the time off, so we decided to head over to the Hershey Lodge and cross our fingers that the park would open the next day.. 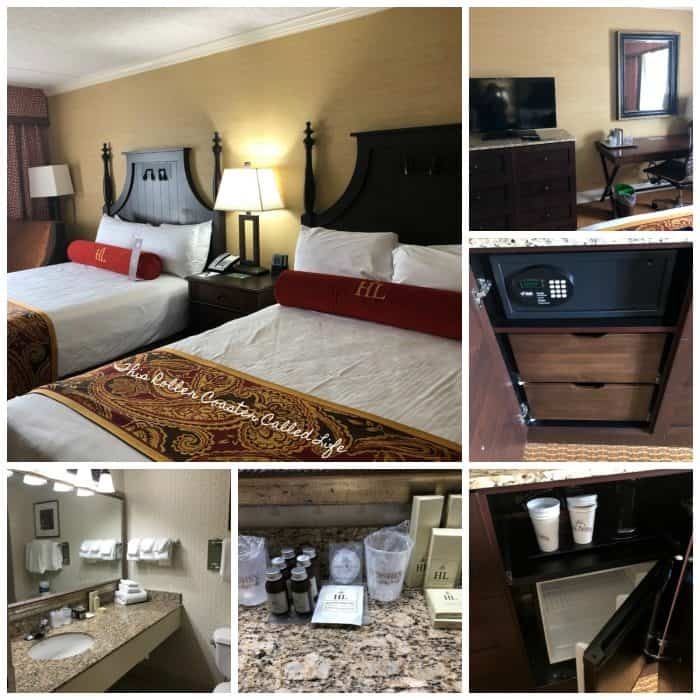 When we arrived at the Hershey Lodge, we were able to get into our room immediately as it sounded like there had been quite a few cancellations due to the rain and the park being closed. As always, our room was clean and comfortable. Our room was located in the Kisses Tower, which is our favorite room location at the Hershey Lodge. After we left our bags in our room, we went down to Marvel Boy’s FAVORITE place to eat. Any time we are in Hershey near a meal time, my son ALWAYS asks to eat at The Bears’ Den. Not only is the restaurant sports-themed, but it also has many televisions playing sports. 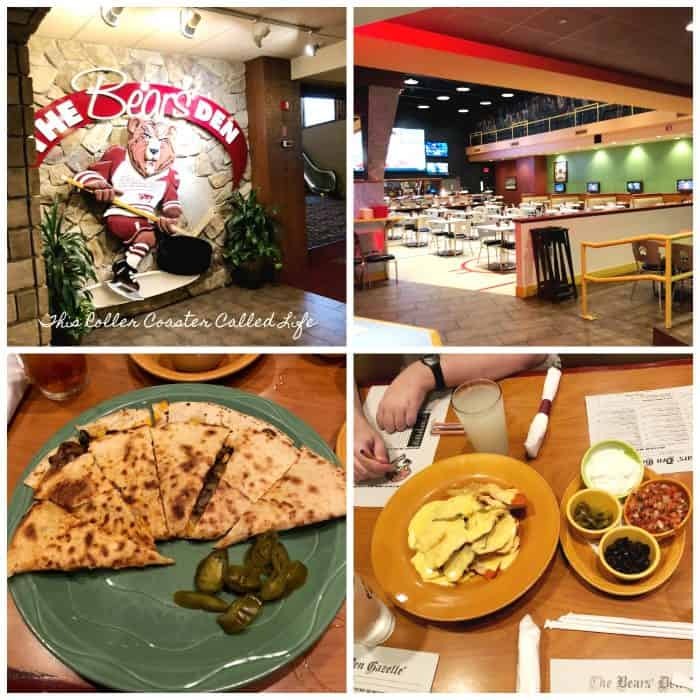 We all like the food at The Bears’ Den, but Marvel Boy’s favorite is the cheese dip. It has to be the BEST cheese dip EVER. In the bottom right picture, are the nachos we ordered. Our waitress calls them the “deconstructed” nachos as they usually come with the olives and jalapeños on them. Since not everyone likes olives and jalapeños, we usually ask for just the cheese on the chips and everything else on the side. It is so good! I really like the veggie quesadilla! The portions are really large! I wish I had taken a pictures of onion rings I got one night, as it was a huge plateful! After lunch, we headed out to try the outdoor pool. The picture on the left is from our first day there. Can you see the clouds in the background? Yes, it rained again that afternoon and evening, but we were able to sneak in an hour or so of swimming prior to the rain starting. We love to stop at the Cocoa Beanery for specialty coffees. Of course, the coffees/lattes are themed for chocolate. I really like the latte with peanut butter and mocha! There are snacks that can be picked up at the Cocoa Beanery, and they have rolls and breakfast sandwiches in the mornings. They also have a quick stop out in the lobby in the mornings; however, it is limited fare. 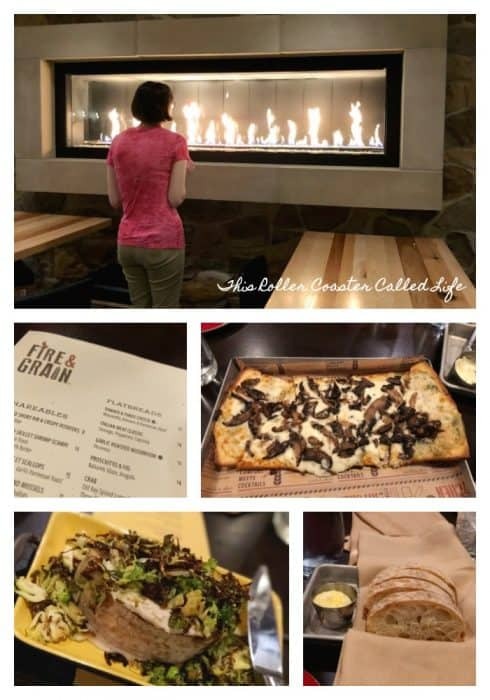 For supper, we went to Fire & Grain. Fire & Grain was just opened last year, and it has quickly become a favorite of mine. The kids love the bread that comes out before the meal, and I’m addict to the Roasted Garlic Mushroom Flatbread. It is so yummy! For dessert, I highly recommend the S’mores Jar. I didn’t have it on this particular trip, but Songbird and I have had it in the past, and it is awesome! Before we went to bed, we heard that Hersheypark was going to closed the next day. They just couldn’t get the flooding under control/cleaned up. While disappointed that we wouldn’t have our cabana day, we were determined to still have a great time, and that we did. The next morning, we got up early and went down to Cocoa Beanery for a quick bite to eat before heading over to Hershey’s Water Works. We all love swimming here. While it is usually a little crowded during the summer, it wasn’t this morning. 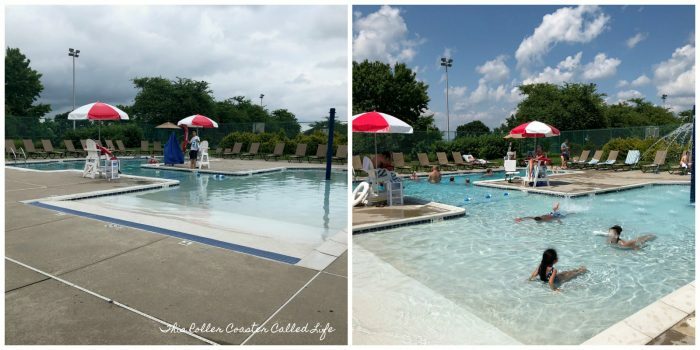 We must have spend a couple of hours or more just swimming in the pool, sliding on the water slides, playing games in the arcade, and checking out the LEGO table in the activity room. Since I had hurt my knee prior to our trip, I actually sat and watched the rest of the family swimming while I sipped on my latte from the Cocoa Beanery. It was very relaxing! After Hershey’s Water Works, it was on to the outdoor pool. By this time, it was getting pretty hot outside. There was no rain, so it was getting pretty hot outside. 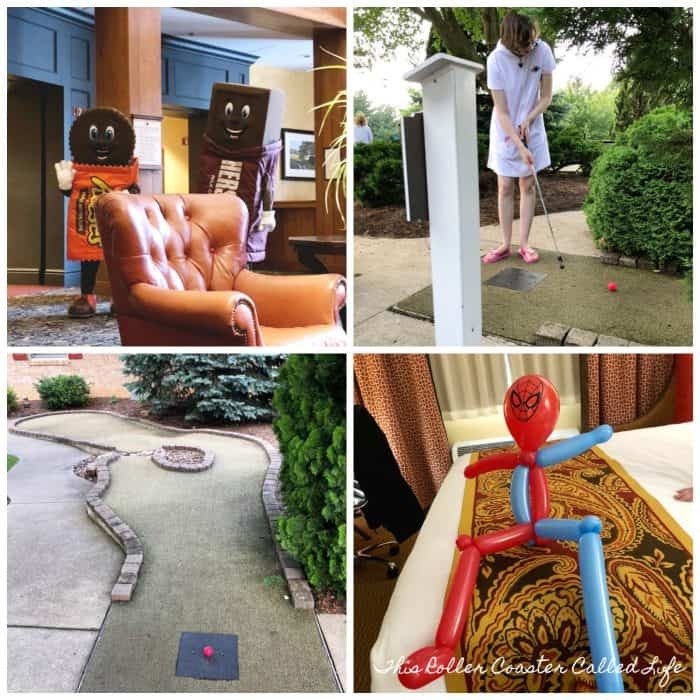 Did you know that Hershey Lodge has its own mini-golf course? Yes, it does. It is beside the outdoor pool. There is also a fenced in area with a tennis court and basketball court. There really is a lot to do at Hershey Lodge! Besides all the amenities, the activities staff also made sure to add some extra activities to the line up to make sure there was plenty to do for the guests because the park was closed. There were plenty of character visits, arts and crafts, and balloon creation to keep more “bored” kids busy and happy. They even have s’mores roasts in the evening (for an additional fee). We were so tired after such a busy, fun-filled day that we ordered room service for supper and crawled into bed. We were bummed that we had to check out in the morning and head back to work. 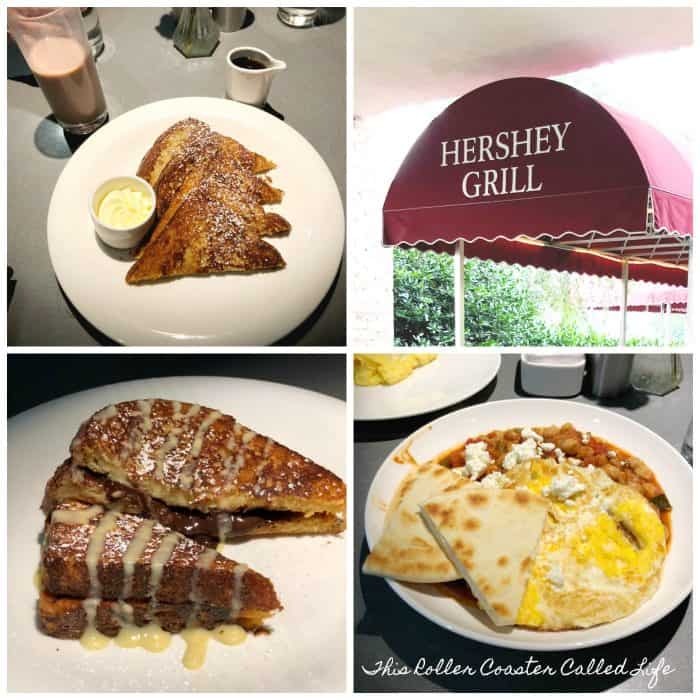 When we got up in the morning, we packed our bags and headed to the Hershey Grill for breakfast. It was such a delicious breakfast! By this time, Don had already headed to work, so it was just the kids and I. The kids got cinnamon French toast and s’mores French toast. I got the Moroccan breakfast bowl. The bowl had the perfect amount of spice and really filled me up for the morning! YUM! Now, it was time to gather our things and head back home. While we didn’t have the mini-vacation we had planned, but still had a wonderful time. This trip showed us just how much the Hershey Lodge has to offer. We have stayed here many times before, but it was always in conjunction with time at Hersheypark. We haven’t always taken full advantage of everything that the Hershey Lodge has to offer. With the summer winding down, I’m realizing how much fun a fall trip to the Hershey Lodge would be! 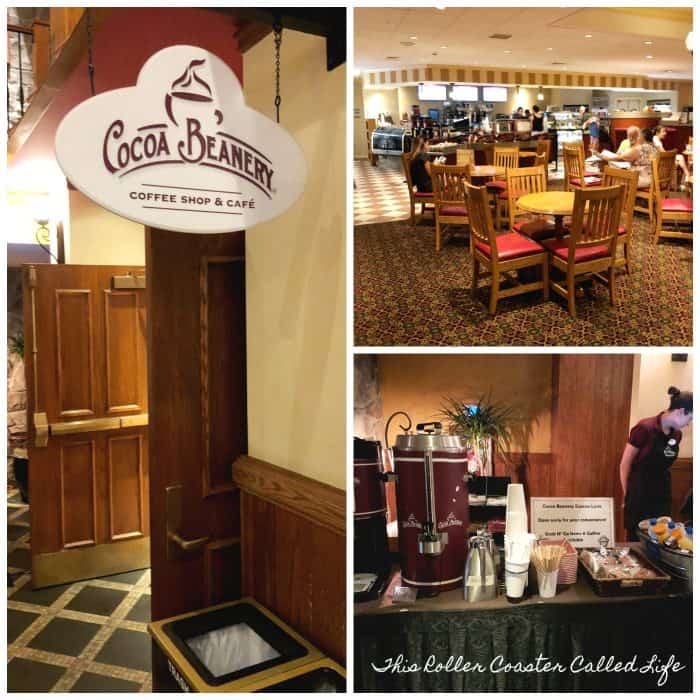 Disclosure: I received one night’s lodging at the Hershey Lodge; however, I paid for a second night and all my family’s food and snacks (and lots of latte…) myself. All opinions are my own.